These stockings are a family tradition starting in the 1950's. I have friends with the same tradition. They are a work of art. I enjoy making them and teaching others to make them as well! 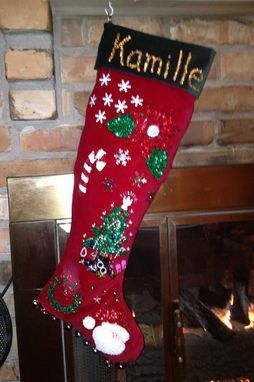 Each shape is hand sequined then sewn on the cotton velvet stocking. These started at Neiman Marcus in the early 1950's. 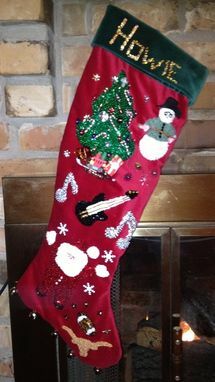 Price depends on the details wanted on an individual stocking. I have created my own designs. 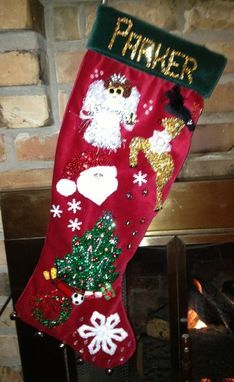 This stocking is 24" long and 8" wide at the cuff.